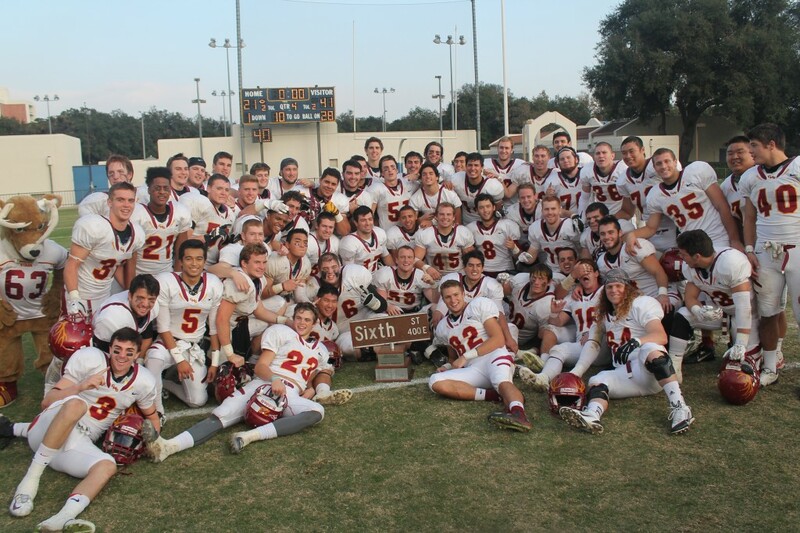 CLAREMONT, Calif. – For the second-straight season, the Battle of Sixth Street trophy belongs to the Claremont-Mudd-Scripps football team. Behind three defensive touchdowns – two pick sixes and a fumble recovery in the end zone – to go along with six interceptions, CMS defeated Pomona-Pitzer 41-21 on Nov. 15 at Merritt Field in the annual rivalry game. With the win, CMS is now 34-23 overall in the series. CMS finished the season with a 5-4 record and tied for third in the conference standings. CMS never trailed in the game, taking a 7-0 lead on its first offensive possession of the day when sophomore quarterback Trey Reynolds (CMC) found junior wideout Ryan Farney (CMC) for a 28-yard score through the air with 10:37 remaining in the first quarter. Reynolds only threw 16 times on the day but still managed to throw for 236 yards and three touchdowns with one interception. A penalty on the ensuing kickoff pushed Pomona-Pitzer back to its 10-yard line to start its drive. On a third-and-13 play, senior linebacker Max Winsberg (CMC) sacked Pomona-Pitzer quarterback Alex Bresler in the end zone and junior defensive lineman Andrew Sova (CMC) recovered the ball for the touchdown and a 14-0 lead, just five minutes into the game. With Pomona-Pitzer threatening to score on its next possession, Winsberg picked off Bresler and ran the interception back 93 yards for the score and a 21-0 lead with 4:47 left in the first quarter. In the game, Winsberg closed out his CMS career with two interceptions, two forced fumbles, a sack, a touchdown and 10 tackles. At the beginning of the second quarter, Reynolds found freshman wide receiver Trey Smith (CMC) for a 47-yard touchdown pass to make it 28-0 with 14 minutes left before halftime. Pomona-Pitzer’s first points of the game came on a 27-yard field goal by Kevin Masini with 5:33 left in the second quarter which finished off an 18-play, 66-yard drive which took over eight minutes. Any thoughts of a second half comeback by Pomona-Pitzer ended quickly as CMS tacked on another touchdown at the start of the second half to make it 35-3. Reynolds hit junior receiver Tyler Stanek (CMC) for the 76-yard touchdown. Stanek had six catches in the game for 109 yards. The first touchdown of the game for Pomona-Pitzer came with 8:08 left in the third quarter on a 6-yard touchdown pass from Luke Lowell to Brett Harper which made it 35-9 after a failed two-point conversion attempt. CMS’ final touchdown of the game came in the third quarter, a 10-yard interception return for a score by sophomore defensive back Tiger Brown (CMC) which made it 41-9. In the final six-plus minutes of the game and with the game in hand for CMS, Pomona-Pitzer added a pair of touchdowns to make the final score 41-21. In addition to Winsberg’s two interceptions and one by Brown, freshman defensive back Victor Bunce (CMC) added two interceptions and junior defensive back Will Shannon (CMC) had one.